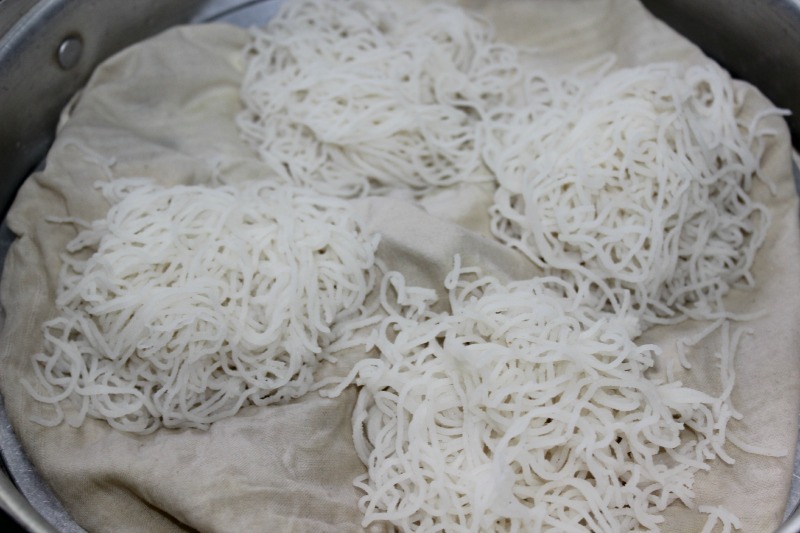 Idiyappam is a steamed breakfast made with rice flour.To make Idiyappam we need an Idiyappam pala(sevai nazhi)(Idiyappam maker) and an Idly maker to steam them.The rice flour is made into a soft dough and then pressed through idiyappam maker to make these string like structures called Idiyappam. Though being a time consuming breakfast to do in the morning I love to make them for they are steamed without any oil.I do reserve some idiyappams to make Sevai varieties for lunch like Masala sevai,Lemon sevai and Sweet sevai. Make your breakfast healthy and tasty by making these homemade idiyappams.Also check my post on Karupatti Idiyappam. Soak parboiled rice or raw rice in water for 10 mins,drain the water and dry them by spreading in a cloth for an hour or two.When completely dried grind them in your mixer or get it done in a mill. 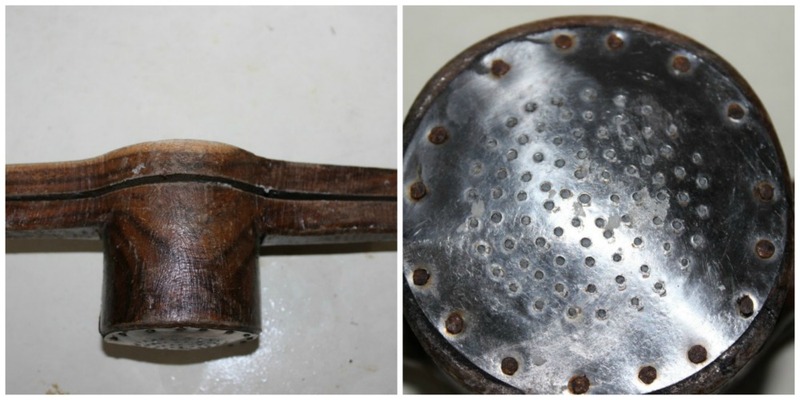 This is the easiest way,just grind the parboiled rice and use it to make idiyappams. Take 1 cup parboiled rice and 1 cup raw rice and grind it in your mixer and then sieve or get it ground from the mill. Mix the idiyappam flour with salt and add boiling water to the flour.Make a soft ,smooth dough without any lumps and knead it well. 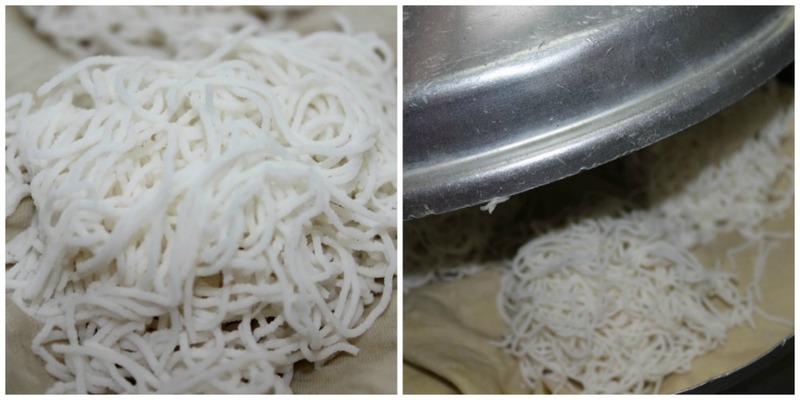 To make Idiyappams we need Idiyappam maker also known as Sevai nazhi. 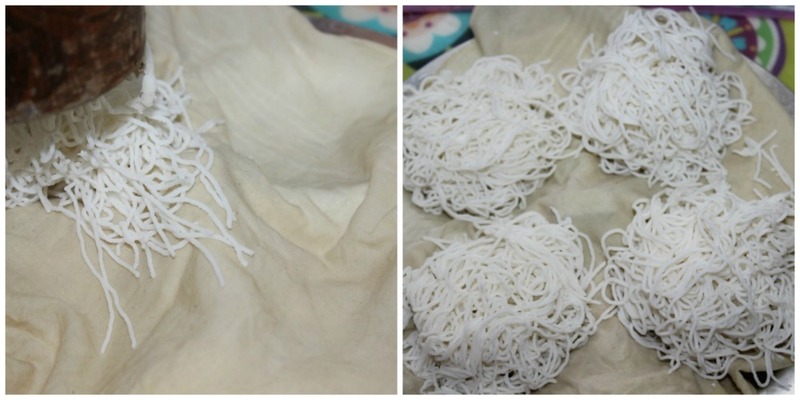 Fill the Idiyappam maker with the prepared dough.Grease your idly plates with oil,as my plates has holes in it i have covered it with a damp cloth.Now press the maker to squeeze out the dough in a circular pattern to produce long strings. 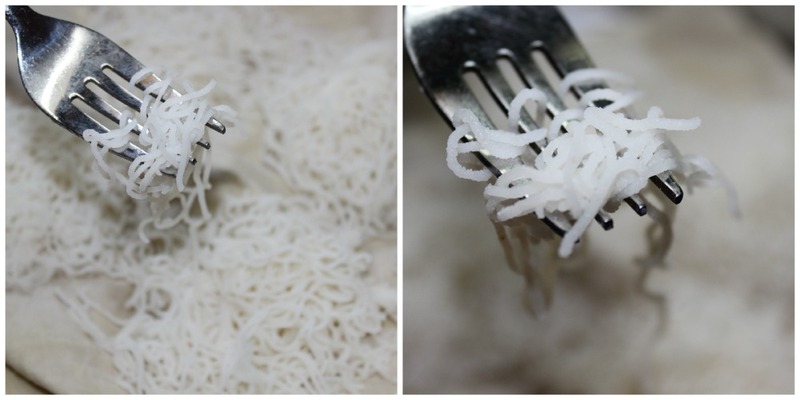 The Idiyappams should have string like structures.Pour some water in the idly cooker,place the plate with the idiyappam inside and close the idly cooker with the lid and steam for 8-10 mins. The steam gushes out of the idly cooker,open the lid and see whether it is cooked. Serve Idiyappams hot with coconut milk and sugar.